A board displays the closing numbers after the closing bell of the Dow Industrial Average at the New York Stock Exchange on January 11, 2018 in New York. Wall Street stocks finished at fresh records Thursday behind gains in industrial and petroleum-linked equities, resuming their upward climb after a one-day pullback. 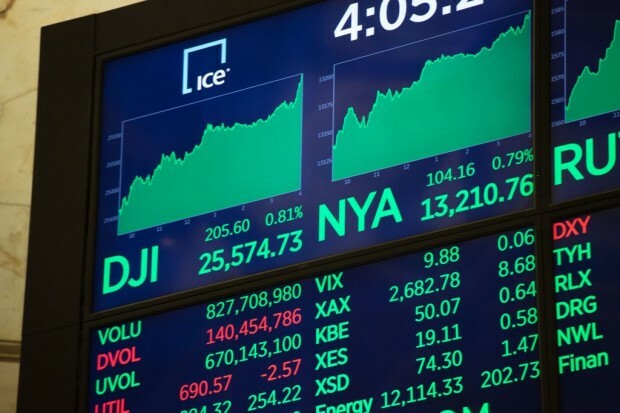 At the closing bell, the Dow Jones Industrial Average stood at 25,574.73, up 0.8 percent. The broad-based S&P 500 gained 0.7 percent to 2,767.56, while the tech-rich Nasdaq Composite Index advanced 0.8 percent to 7,211.78.